The rosin community has come a long way since it’s humble hair straightener days. In just a few short years rosin technology has tremendously advanced, making the flat iron method a thing of the past! Through blogs, forums, and word of mouth, solventless extraction techniques have been shared and perfected and one thing is certain, nothing beats a quality rosin press! Firstly, what is a rosin press? A rosin press combines both heat and pressure to extract desired cannabinoids from cannabis flower, hash, or kief. It is a simple method to produce a quality product, within seconds. The combination of heat and pressure works to create a potent extract—rosin. The resulting concentrate is absent of harmful chemical solvents found as a result of traditional BHO extraction methods. 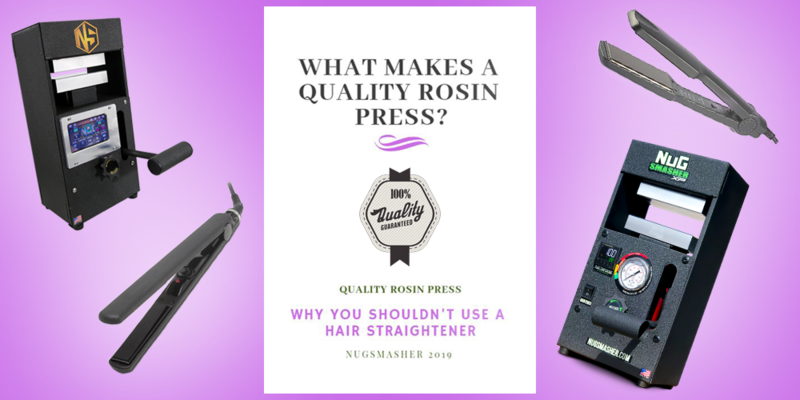 You may be wondering, if rosin only requires the combination of heat and pressure, then why not opt for the $30 drug-store flat iron? Significant factors come into play when considering your extraction method. The quality of your machine effects the desired ease, consistency, yield, and quality of your rosin extraction. Choosing to use a flat iron will result in the lack of a full extraction. Flat iron extractors will fail to benefit from full potential yield, ultimately effecting cost wasting valuable material. 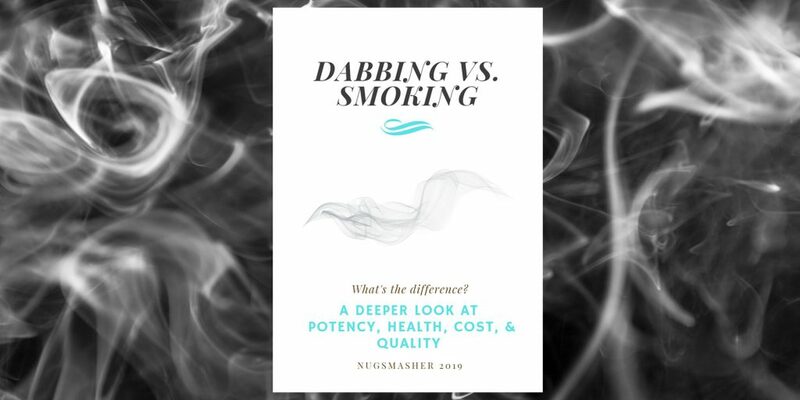 All of these elements are essential for a high-grade product and are maximized with the use of a Nugsmasher rosin press. When browsing through the blogs and forums that initially popularized rosin techniques, we’ve gathered a lot of valuable user information. Scanning through a Reddit search of “Best Hair Straighteners for Rosin” users recommend a flat iron with a digital temperature reading. Commenters all seem to be in agreeance that an additional thermometer or temperature gun is necessary due to the tendency towards inaccurate readings. One Reddit user claims his Remington brand flat iron—a commonly suggested model—had a temperature difference of 20° – 40°. Although it may not make any significant difference in hair styling, flat irons also tend to have hot spots and heat inconsistencies throughout their plates. While the temperature ranges vary per flat iron, many of the lowest heat settings are anywhere around 220°F – 300°F. To achieve low temperatures during a flat iron press, users seem to have peculiar suggestions that can make any rosin connoisseur cringe. An accurate temperature reading is essential in extraction as a temperature difference as small as 5° – 10° can drastically change your result. To preserve terpenes and flavor it is advised to stay in the range of 190°F – 220°F but as mentioned, most flat iron temperatures don’t have heat settings below 220°F. Accurate temperature controls come standard on every Nugsmasher press. Normal operating temperatures are between 190°F -215°F although our plates can be as low as room temperature and should not to exceed 350°F. Most flat iron plates are constructed out of ceramic or are ceramic-coated metal. Ceramic-coated plates are known to have poor heat distribution and difficulties retaining temperature. Due to the delicate material, ceramic flat irons are known to be used best for fine hair, making them susceptible to cracks when put under too much pressure. This makes for a poor extraction tool because of the constant use and pressure that is required to extract rosin. Many flat iron users claim frequently damaged plates, forcing them to make multiple purchases a year. Aluminum plates, on the other hand, are incredibly durable. All Nugsmasher versions are constructed with the US made structural steel and T6 6061 aluminum. Standardly installed heaters are 160W each—480W per plate total—which allows the unit to warm up to useable temps in as little as 5 – 10 minutes. Not only are aluminum plates durable but they are fast to respond to heat and easily hold a consistent temperature throughout, making them the extractors number one choice! 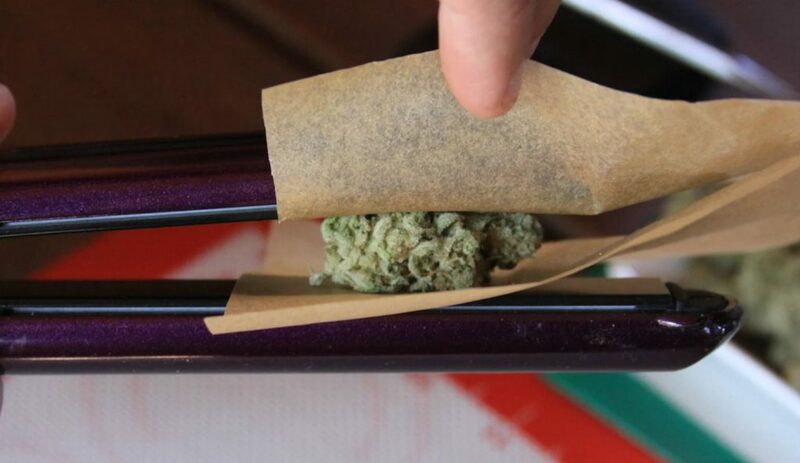 Pressure is equally as important as the temperature when it comes to extracting rosin. With the use of a flat iron, accurate pressure is next to impossible to achieve. Flat iron extractors are often left to the strength of their hands or their body weight to apply pressure. This will not only be inconsistent between separate extractions but will naturally fluctuate during each extraction performed. On our line of Nugsmasher units, pressure ranges from 2 to 20 tons. The Nugsmasher XP, Touch, and Pro are equipped with accurate pressure gauges making pressure easily controllable. Although each machine is powerfully equipped, the pressure is easily applied. Our Nugsmaher Touch makes extraction easier than ever with a 5″ interactive color touchscreen display. There are tremendous benefits to extracting solvent-free rosin from the comfort of your own home or business but making sure you have quality tools will ensure the best quality and the best yields. A flat iron may have started it all, and to that, we owe our gratitude but there are no better machines for extraction than our Nugsmasher rosin presses!